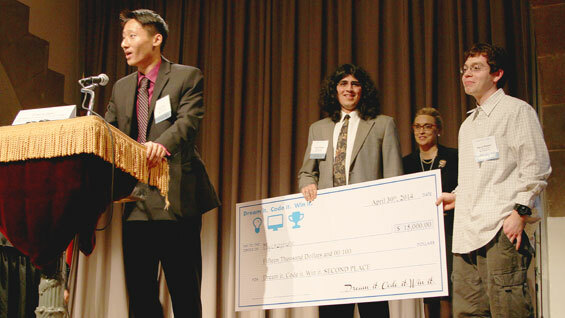 A team of Cooper Union engineering students has won a $15,000 prize from the first-ever Dream it. Code it. Win it. software competition during an award ceremony held in the Great Hall last week. Alyssa Davis, Aman Grewal, David Sheckhtman, Kevin Shi and Robert Walsh, under the faculty advisment of Prof. Eric Lima, won the prize for "Mycrophone," a smartphone app born out of a problem that has vexed students and instructors since the age of the Lyceum: how to effectively handle questions from a large audience during a lecture. Eric Lima, assistant professor of mechanical engineering, was the faculty advisor to the team. 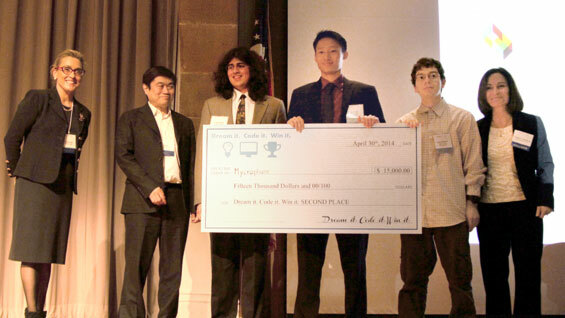 The Cooper students' software solution took second prize along with teams from Quinnipiac University, who took third, and Harvard College who took the top prize. "The event was great," Kevin Shi says. "We felt incredible." The winners were selected from over a hundred submitted projects from across the country, according to organizers. "Dream it. Code it. Win it.," sponsored by the MIT Club of New York and other organizations, offered big prizes to "celebrate and reward creativity in computer science," Cristine Dolan, the event moderator and an officer of the MIT Club of New York, says. "Instead of organizing an event that had tremendous expense, we gave the money to the kids. We wanted the prizes to have a positive impact on the students' lives." The goal, she says, was to encourage students, especially women, to take up computer science as a major by encouraging creativity over coding expertise. The awards ceremony was preceded by a panel discussion on "The Future of Innovation in a Networked World." The panel included Teresa Dahlberg, dean of the Albert Nerken School of Engineering, Joi Ito, director of the MIT Media Lab, representatives from Google, Yahoo!, Forbes and others. The panelists were also the judges for the contest finalists. Dean Dahlberg summarized the panel's subject: "Because networks and software have become economic drivers across all business sectors, while standards and open source tools now enable virtually anyone to create something new and bring it to market, computer science has become an incredibly creative and exciting discipline." "From the moment I heard about the event, I knew a Cooper team could win, despite our small size," Dean Dahlberg says. "Our students embody the ethos of creativity and innovation. The 'Dream it' event was an opportunity to make this aspect of Cooper Union more visible to New York City and the broader tech innovation community, as well as to prospective freshmen." The Cooper team's winning application took shape during their freshman year, Kevin Shi, one of four sophomores on the team, says. "Mycrophone is a smartphone app designed to help shy, introverted students. It allows you to submit a question to the instructor through your smartphone, and it will appear for your teacher to see on their computer during their presentation. This way it lets shy students participate and submit questions in class. It has a voice aspect too. The original idea was a solution for a 1000-person lecture room where one person will speak and no one else can hear them. It turns the smartphone into a microphone." "The problem they were looking to solve was interesting," Cristina Dolan says. "They were trying to give everyone an equal voice in the classroom. The judges liked the fact that you could use technology to solve a problem of different personalities in the classroom. The Cooper team had a very clever solution for it." "Each one of us has different idea of what we want to do with the money," Kevin Shi says. "Collectively we want to have a party to celebrate. But working on the project is definitely a consideration, especially with the support and excitement following the event."